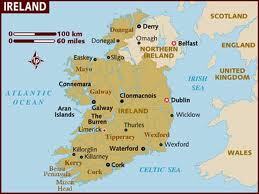 What to cook for the beautiful country of Ireland from whence many of my relatives came? Known for such wonderful things such as lyric song and poetry, great beer, hospitality, rugby and an emerald country-side, Ireland (perhaps somewhat unfairly), is not known for it's culinary chops. But don't despair, Ireland does produce some pretty amazing bread, and brown soda bread just happens to be the country's national loaf. To find the perfect brown bread recipe, I turned to two of my favorite bread cook books: a dog-eared copy of Beard on Bread, by none other than James Beard and another extremely comprehensive bread bible, Bernard Clayton's New Complete Book of Breads. Both revered bakers and authors, their brown bread recipes differ slightly, Clayton's adding sugar, butter and an egg to create a lovely rich loaf of brown soda bread that is served up in Dublin's Royal Hibernian Hotel. In my world, anything with butter in it pretty much trumps everything, so I went with Clayton's version, but James Beard's simple recipe is wonderful as well. Located in Northwest Continental Europe, Ireland is divided into the Republic of Ireland and Northern Ireland, the likes of which have been embroiled in cultural and religious clashes for hundreds of years. Ireland's culinary traditions are influenced by it's temperate growing climate, and is best known for the potato, which was introduced in the the second half of the 6th century. The country is also known for excellent beef, which it exports world wide. Irish stew, bacon, cabbage and baked goods are the hallmarks of Irish cuisine. Preheat oven to 400F 20 minutes before baking. In a bowl mix together all of the dry ingredients. With your fingers, work in the butter until it is absorbed by the fl9our, and the mixture resembles tiny, soft breadcrumbs. Make a well in the center of the mixture. In a separate bowl, lightly beat the egg and stir in the milk. Gradually pour the egg-milk mixture into the well, mixing first with a spoon and then by hand until it forms a stiff dough. Lift the dough from the bowl and place on a lightly floured work surface. Work the dough with your hands a dough knife to thoroughly blend all the ingredients. Do not knead. The butter in the dough will make it easy to work without sticking to the work surface or the hands. Sprinkle with flour if it sticks. Shape into a plump round ball. Pat down the top slightly, and with a knife or razor blade, cut a 1/2" deep cross on the top. Place the loaf on the baking sheet, and bake until it has browned and has opened dramatically along the cuts, about 45 minutes. Remove the bread from the oven and place on a wire rack to cool before cutting into thin slices. Final Assessment: A beautiful, hearty bread that's full of flavor and insanely easy to make - no yeast, no proofing....not problem. Slather it up with butter and call it breakfast, a snack or an accompaniment to soup, salad or a main course.